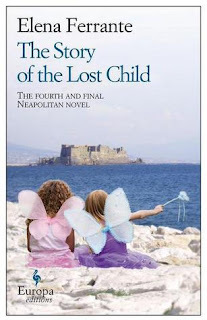 Once upon a Reading: Elena Ferrante, "The Story of the Lost Child"
Elena Ferrante, "The Story of the Lost Child"
(Book Four of the Neapolitan Novels – Maturity, Old Age) – Storia della bambina perduta. Translation by Ann Goldstein – e-book. I don’t know if my habit to read three or more books at the same time is good or bad, but it surely gave me the opportunity to discover connections between books I would have never put in the same sentence in other circumstances. For example, it was fun to discover, in two very dissimilar books, Martin Amis’s The Pregnant Widow and Dan Lungu’s The Little Girl Who Played God, a similar reaction of the characters in front of some landscape while visiting Italy, and which seemed to their awed eyes so impossible picturesque that it had acquired the glossy quality of a postal card. Or to discover that both Alice Munro’s neorealist The View from Castle Rock and Kazuo Ishiguro’s magic realist The Buried Giant managed to find that elusive border between reality and mythology. Not to speak about those times when a book effectively has called another – as Umberto Eco’s Foucault Pendulum did with Alexandrian’s History of the Occult Philosophy – for how could I explain otherwise the fact that I received the second (without even asking) from my former high school teacher just when I was struggling to put in order some random information about occultism wickedly given to me by the first? Then she said to me in a low voice, almost a whisper, that I was an evil woman, that I couldn’t understand what it meant to truly love and to give up one’s beloved, that behind a pleasing and docile façade I concealed an extremely vulgar craving to grab everything, which neither studying nor books could ever tame. Suddenly I felt with shame that I could understand, and excuse, the irritation of Professor Galiani when she saw her daughter on Pasquale’s knees, I understood and excused Nino when, one way or another, he withdrew from Lila, and, why not, I understood and excused Adele when she had had to make the best of things and accept that I would marry her son. Fortunately, the second part gets better, although the circular structure disclosing the meanings of the first images is a little old-fashioned and its symmetry – from dolls to child and return to the dolls, although emotionally touching, is somehow too sought, too artificial. Lila is not in these words. There is only what I’ve been able to put down. Unless, by imagining what she would write and how, I am no longer able to distinguish what’s mine and what’s hers. I thought: now that Lila has let herself be seen so plainly, I must resign myself to not seeing her anymore. They are pretty addictive - I read the first one in Italian but I couldn't wait to obtain the other three in the same language so I read them in English (very good translation, by the way, I hope it is so in Romanian too). I think you'll like them - Ema and Lavinia (it was Lavinia who sent me the books - very kind of her) like them a lot! Annie Dillard, "Living by Fiction"
Umberto Eco, "Le pendule de Foucault"